It’d be easy to think that ZAUM is just another group of derivative Sleep worshipers. The name, the cover art, and the sparse instrumentation centering around bass guitar and drums places this record squarely within the lineage of Al Cisneros. But to write this record off as Om-worship would be severely underselling it. While Oracles owes a lot to those aforementioned desert odysseys, its low-frequency jams take place in a far more different wasteland – somewhere ancient, somewhere desolate, and somewhere that will provide nourishment for those who can brave the empty wastes and find the oasis of riffage hidden within. Comparisons to Om are inevitable, but ZAUM doesn’t fall short when standing next to their Californian forebears. Their riffage touches on higher notes than Om’s consistent low rumble, with high-fret explorations that recall a less suicidal depressed Bell Witch. 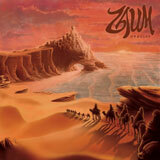 But ZAUM‘s real sense of uniqueness comes across in the other elements they weave into their sound – the Central Asian throat singing, low synthesized drones, ritualistic chants, and sweeping sitar textures all call to mind something ancient and vaguely Eastern, like the Saryazd Fortress in Iran or the Egyptian ruins surrounding the Siwa Oasis. It’s a welcome change from Om’s extra bells and whistles – although God Is Good and Advaitic Songs sound as lush as the Hanging Gardens of Babylon, they always remind me of that one crystal shop run by a ponytailed guy in Birkenstocks who can’t stop talking about chakras. You know what shop I’m talking about. They’re everywhere. My recommendation for this record comes with a caveat, however. Doom metal is often accused of being long-winded and masturbatory, with artists too lost in their heady haze of atmospheric interludes and endlessly repeating riffs to bother including actual songs worth listening to. ZAUM comes close to these pitfalls, but they never succumb to them. There is always some sense of momentum apparent in every song, whether it be the brooding build to a rapturous climax in the finale Omen, or the groove lying at the centre of Peasant Of Parthia that increases the pace to something almost approaching a gallop. Their love for builds and atmospheres could be tempered with a bit more restraint, but those familiar with the style will have their attentions held. Still, much of this album will undoubtedly be best appreciated by those with their heads full of herb fumes. I could easily see ZAUM making waves with this release. Oracles satisfies, and not just for those who felt that Om’s recent direction sounds too neutered. There’s enough uniqueness of sound and sureness of purpose on display here to win over those only peripherally interested in this sub-strain of doom, and as a first full-length album, it offers tantalizing promises of musical regions yet to be explored.